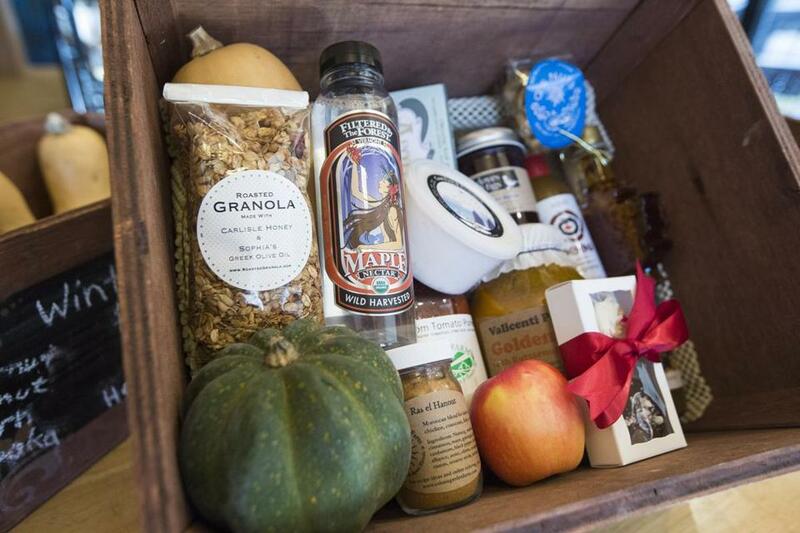 A box of locally sourced products sits on a table at Wildflower Pantry. At Wildflower Pantry, a 3-pound sweet potato sits in a basket on a table near the door. The reddish-purple root is rugged, round, and fat, and as beautiful as a sweet potato can be. It was grown on a local farm, like all the other vegetables at the new Brighton market, which sells a treasure trove of New England cheese, milk, bread, prepared foods, and products from artisan makers. Kerry Kokkinogenis opened the shop in November, modeling it after Boston Public Market. Customers can find here a bounty from producers who are fixtures at farmers’ markets, and whose products are often sold at different stores scattered around the area — root vegetables grown at Winter Moon Roots in Hadley; milk from Shaw Farm in Dracut; breads from Dan’s Brick Oven Bread in Richmond, N.H.; nuts roasted at Q’s Nuts in Somerville; soups by the Soup Guy in Dover, N.H.; scones baked at Fraulein’s Bakery in Taunton. Kokkinogenis’s intent is to also make it more convenient for small producers to reach their audience. “Farmers’ markets are excursions one day a week for a few hours. Each has different things. From the vendor side, markets can be challenging. They have to not only be the grower, but the transporter, pay the fees, and get staff,” she says. Wildflower’s space was for decades Castlebar Pub, and Kokkinogenis refurbished it, leaving remnants of the old watering hole. The counters are segments of the pub’s dark wood bar, and a decorative ceiling was restored. Now the room is bright and airy, with light, wide-plank wood floors. The exterior is painted a cheerful yellow with a large wildflower. “Dandelions and other wildflowers are often the most nutritive, the most giving, a little scruffy, but durable,” she says. This is what Kokkinogenis envisioned when she named her new market. 575 Washington St., Oak Square, Brighton, 617-276-6299, www.wildflowerboston.com.